How to Litigate Before the Internet Courts in China? 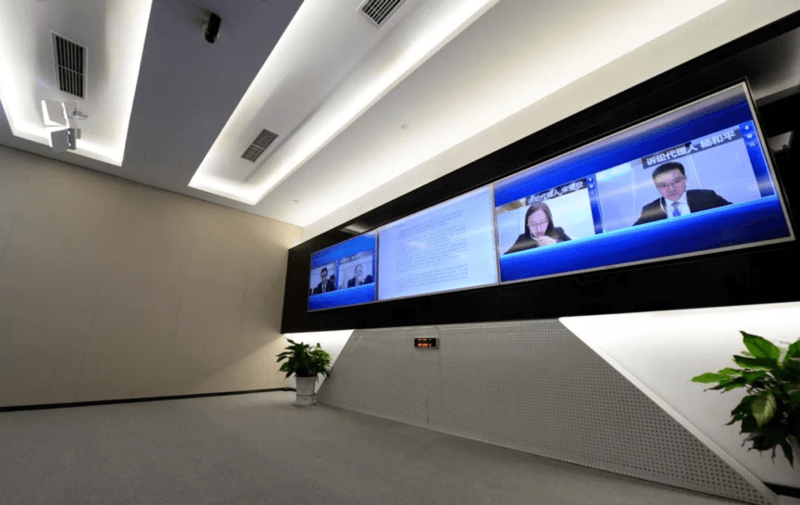 There are currently three internet courts in China, namely the Hangzhou Internet Court established in August 2017, and the Beijing Internet Court and the Guangzhou Internet Court established in September 2018. According to China's Supreme People's Court (SPC)’s provisions, internet courts shall run court proceedings largely online, including filing the lawsuit, accepting the filing, service of process, mediation, exchanging evidence, pre-trial preparation, hearing and announcing the judgment, etc. Parts of the proceedings can be conducted off the line, only upon the request of the parties involved or the needs of the trial. 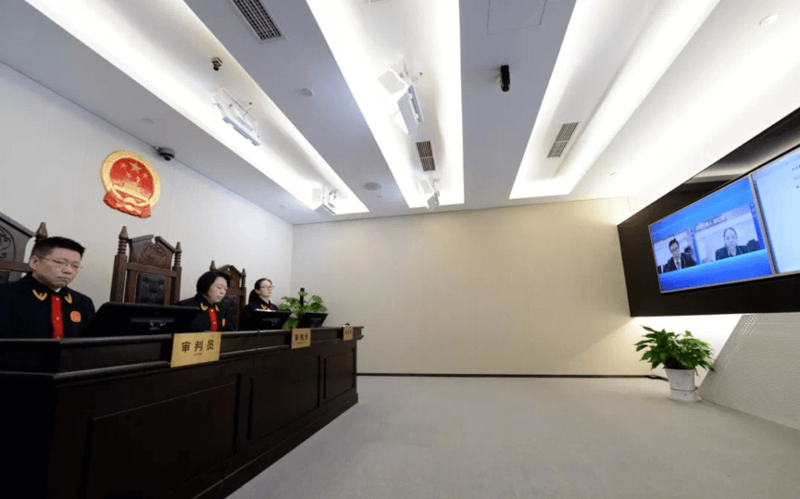 In this article, the Beijing Internet Court is used as an example to interpret how internet courts in China hear cases. To ensure that online cases are filed by litigants and lawyers themselves, litigants and their lawyers are required to register a real-name account on the official website of the internet court and verify their identity by means of facial recognition. The registration agreement emphasizes that the act made by accounts that log in to the electronic litigation platform with authenticated identity will be considered as an act made by the user. (1) Filling in the basic information of the case. It is worth noting that, unlike traditional Chinese courts, the internet court requires plaintiffs and defendants to provide their mobile phone number, fax, e-mail, and instant messaging tools such as China's popular WeChat and QQ, because legal instruments will be served on litigants with the above-mentioned methods. (3) Uploading evidence. Currently, the platform supports evidence in the format of “Word, Excel, PDF, video, audio, compressed files, pictures, TXT”, covering most formats of electronic evidence. According to the statistics of the Beijing Internet Court, since online filing is no longer limited by the working hours of the court, 14% applications for filing have been uploaded on non-working days, and 24% have been uploaded during non-working hours on weekdays, altogether accounting for over one-third of all applications filed. Courts will send a notice and a verification code to the defendant by SMS or email after accepting the case. After the defendant logs in to his/her account on the internet court website and enters the verification code, his/her account will be linked to the case in question. Both litigants and their lawyers are allowed to check the service of legal instruments, submit documents, present and cross-examine evidence, participate in online trials, and receive the judgment through the website of internet court. You can see the video “Beijing Internet Court Guide” produced by the Beijing High People’s Court. 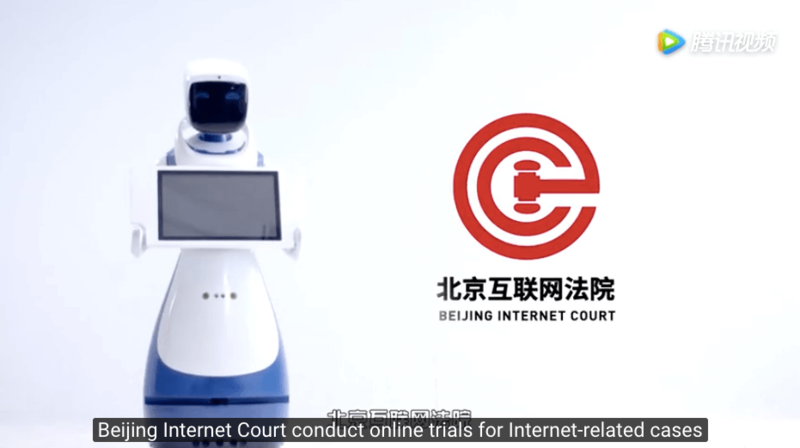 Please click HERE for the video "Beijing Internet Court Guide". The hearing is done through video. Judges of the collegial panel sit in a courtroom where only stands a huge screen without no litigants or observers present. On the left and right sides of the screen are the plaintiff and his/her lawyer, and the defendant and his/her lawyer captured by their cameras, while in the middle are the documents or evidence displayed by the parties involved. Photo 1: a full picture of the internet court, source: “Jingfawangshi”, the Wechat Official Account of Beijing High People’s Court. Photo 2: the collegial panel during the online trial, source: “Jingfawangshi”, the Wechat Official Account of Beijing High People’s Court. Photo 3: litigants and their lawyers during the online trial, source: “Jingfawangshi”, the Wechat Official Account of Beijing High People’s Court. Photo 4: judge's perspective, source: “Jingfawangshi”, the Wechat Official Account of Beijing High People’s Court. 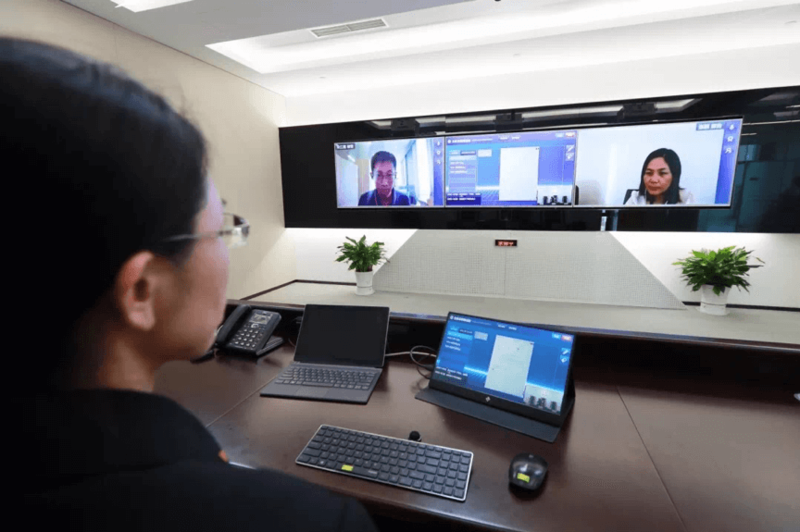 Parties involved can download the remote court client on the website of the internet court and then access the online video hearing system through the client. Parties involved are able to participate in the trial anywhere they can access the Internet, which might lead to a weakened sense of the court ceremony. For example, some parties dress too casually during online trials; or they may attend the hearing in internet cafes, shopping malls, plazas, and other public places; or they are in places noisy and dark or places where unrelated people are around and may interfere with the trial. The Guangzhou Internet Court has had to issue new rules specifically to ensure that online trials remain as serious as traditional trials. Internet courts serve documents on parties through SMS, e-mail and instant messaging procedures, even if the person is outside China. This actually makes international judicial assistance unnecessary when Chinese courts serve documents on parties in other countries, which may be in conflict with China's judicial assistance treaty with relevant countries. Moreover, parties in any part of the world can access the online trial of the Chinese courts through the Internet, which actually allows Chinese courts to “hold a session” in any country. This is already happening. 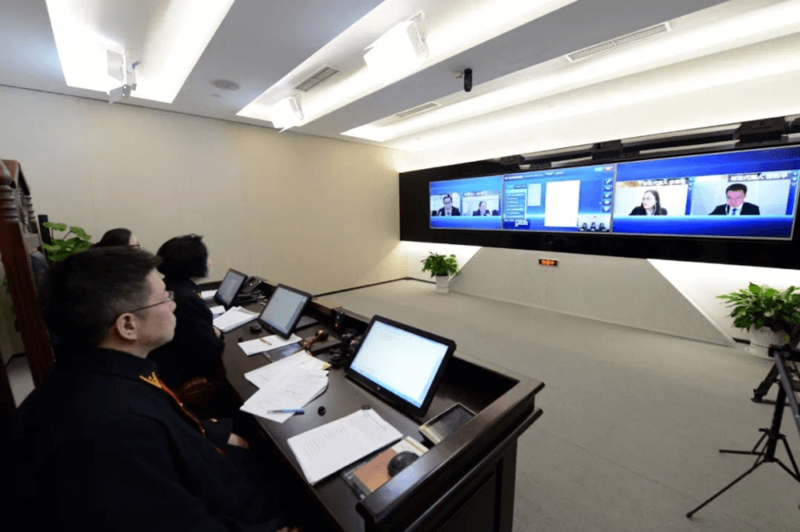 The Hangzhou Internet Court once publicly stated that in one of its trials, a litigant in Canada participated in the entire process of trial through the Internet. Since the SPC does not restrict courts other than the three internet courts from conducting online trials, these courts are also trying to conduct online trials when litigants are in other countries. It was reported that Beijing Fourth Intermediate People’s Court heard an online case concerning the recognition and enforcement of a German divorce judgment, in which one party participated in Germany; Xuanwu Primary People’s Court of Jiangsu province tried a divorce lawsuit online in which the Monacan wife is in Monaco while the husband is in China; Fangshan Primary People’s Court of Beijing Municipality handled a divorce dispute online in which the wife is in Italy and the husband is in Mauritius; for People’s Courts of Ningbo, the number of cross-border mediation or trials has reached 11 for the first 8 months of 2018. Internet courts enable Chinese courts to hear cases wherever the relevant parties are. Since internet courts are no longer subject to geographical restrictions in case trials, which, in many cases, include the border restrictions between countries, traditional court jurisdiction boundaries are very likely to be challenged if this model prevails in future. Zheng Si also contributes to the post.